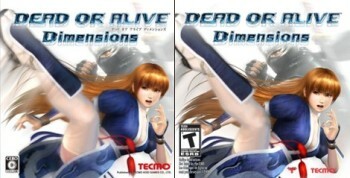 Tecmo has made a minor alteration to the North American cover of Dead or Alive: Dimensions after the ESRB decided that Kasumi kicks a little too high - and shows a little too much thigh. As you might recall, Deep Silver announced a couple of days ago that it had "tweaked" the Dead Island logo for the game's release in North America, turning the "I" in "Island" from a silhouette of a corpse swinging from a tree to a shambling zombie. The ESRB said in a statement that while the game itself remains untouched, the box art violates industry guidelines on advertising and marketing materials. Apparently the living dead are okay, but the dead dead cross a line of some sort. In any event, it's not the only upcoming game that's run afoul of the watchful eye of the ESRB. Dead or Alive: Dimensions features the lovely Kasumi kickin' high on the cover and showing off a little bit of inner thigh in the process. But it's too much skin for the ESRB, which led Tecmo to make a very minor change to the cover; so minor, in fact, that if you weren't looking for it you'd probably never notice. Which leads to the obvious question of, why bother? Was the original cover really so offensive that it couldn't go out as-is, and does the edited cover really change things up enough to satisfy any meaningful shortcoming? I'm all for age-appropriate gaming but this seems almost petty. Dead or Alive: Dimensions comes out in North America on May 25, exclusively for the Nintendo 3DS.